The beginning of Alternative Energy Automation Inc. work was in process automation on farm based Anaerobic Digesters. With its systems installed in one third of all sites currently found throughout Ontario. 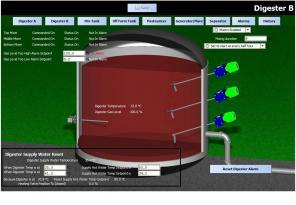 Offering its clients a simple and functional web enabled interface to keep the gas production in check by mixing and feeding the digester on timed interval, measuring various tank temperatures and levels overseeing generator operation and alarming the client by text message when there is a out of normal condition.